Speaking at the conference, Thomas Beyer, PhD, president of the European Society for Hybrid, Molecular and Translation Imaging (ESHIMT), highlighted the advantages of PET/MRI in the medical field and pointed to where its future shone brightest. He underlined his opinion that PET/MRI was less of a modality in clinical routine and more of a noninvasive tumor phenotyping machine. “The clinical utility of PET/MR is challenged by PET/CT, which has excelled in oncology for whole-body staging. PET/MR took a long time and a lot of effort to develop but in oncology yields no superior diagnostic benefits to PET/CT, and its exams are lengthier,” Beyer told AuntMinnieEurope.com ahead of the event. “Instead, PET/MR’s strengths lie in its ‘fifty shades of gray’ soft-tissue contrast, meaning that it can be used locally and regionally for better tumor phenotyping, local staging, and to assay tissue density biomarkers. In addition, the adoption of MR navigators can help compensate for involuntary patient motion, thus, improving the quality and accuracy of the adjoined PET information,” he added. PET/CT has excelled in oncology for whole-body staging. All images courtesy of Thomas Beyer, PhD. PET/MRI is a technical revolution that has led to medical evolution. The benefit over standalone PET is in the conscious choice of CT and MR protocols and in the adoption of CT- and MR-driven correction schemes of PET. PET/MRI is an expensive deblurring machine for PET data. 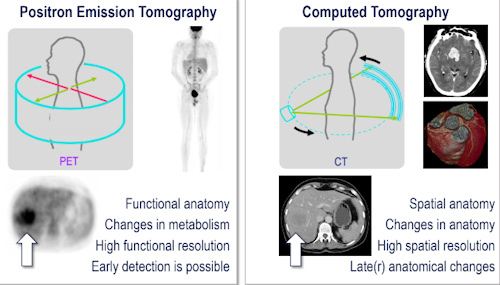 PET/MRI is a promising tumor-phenotyping tool. In his talk, Beyer commented on three meta-analyses, each comprising 1,000 patient cases taken from several studies that demonstrated PET/MRI’s comparable diagnostic value with PET/CT for whole-body staging but higher time costs. Even with faster protocols, the quickest MR technique took 30 to 40 minutes, compared with around 10 to 20 minutes for PET/CT. However, PET/MRI’s capacity for motion compensation meant improved quantification that added greater value to PET images, he continued. Because the duration of the PET process is relatively long, involuntary patient movement such as respiration, heartbeat, and muscle contraction cause blurring in pictures. However, the use of motion detection and motion vectors can reduce this blurring. “If you can improve the value of the images, the heterogeneity of a tumor that may appear homogeneous on CT will become more apparent at the MR level. This improved image quality allows for more robust and more accurate voxel-based analysis, and makes PET/MR a more suitable tool than PET/CT for tumor phenotyping,” he explained. 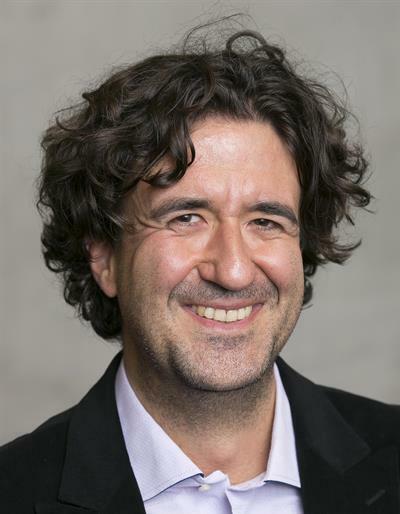 An ongoing study at Medical University of Vienna, where Beyer is a professor of physics of medical imaging, is looking at the possibility of replacing physical biopsy of the prostate with virtual biopsy. The research is being conducted by colleagues in the departments of nuclear medicine, urology, and pathology. Patients with primary prostate cancer undergo a dual-tracer PET/MR exam to noninvasively assess the prostate, which is then surgically removed, sliced, and histopathologically studied. The slices are curated for malignant areas and correlated to the corresponding areas in PET/MR images before serving as an input to machine-learning algorithms. Using such algorithms taught by PET/MR images, programs will identify suspicious areas so that doctors could target biopsies or even initiate treatment for malignant tumors. Thomas Beyer, PhD, from Medical University Vienna. While much work remains to be done, so far preliminary results from 100 patients suggest that purely machine-based differentiation is highly accurate, according to Beyer, and in the short term, this could result in more targeted biopsies. This joint approach would also help to depoliticize the hotly debated issues prevalent in the use of the modality and would prove a cradle for emerging clinical ideas and hypotheses. Current barriers hampering PET/MRI include cost as the latter systems stand at double the price of PET/CT, Beyer noted. There is also a lack of cooperation particularly in the willingness of different stakeholders to share data. Everybody engaged in clinical patient management when PET/MRI is a part of the process needs to join in PET/MR study management, he added. Asked by the meeting’s moderator, journalist and broadcaster Karen Coleman, what he would have done differently with regard to PET/MRI’s development, he said he would have placed the technology in the hands of those with a track record of collaborating together. More than 3,000 attendees registered for the virtual congress hosted by the European Society of Radiology and ESHIMT on Friday. The conference was free of charge and open to everyone with an interest in hybrid imaging, regardless of their prior knowledge. It offered a range of tailored sessions dedicated to both basic and advanced applications in hybrid imaging and its clinical application. The conference was also accredited by the European Accreditation Council for Continuing Medical Education (EACCME), and participants were able to claim 5 CME credits for attending the event.